Judge Dredd is an American law enforcement officer who patrols the streets of a violent futuristic city, with the power to convict, sentence and execute criminals at the scene of their crime. For almost 40 years fans worldwide have followed Dredd on his law fighting missions, through comic books, graphic novels, video games, TV shows and blockbuster movies. Given the popularity of the Judge Dredd enterprise, many online casinos are offering players access to this game. For a reliable, secure online casinos you trust, head to G’Day Casinos, one of our favourite virtual pokies casinos for Australian gamblers. Go to the casino section and you will find Judge Dredd under the ‘pokies’ category. G’Day Casino also allow users to play the game for free, so it’s the perfect way to familiarise yourself with Judge Dredd before you head on to play for real money. G’day Casino makes payouts in Australian dollars and also offer new users a special welcome bonus, so if you’re not already a registered user, now is the perfect time to sign up. Following the popular 1995 film starring Sylvester Stallone, a new addition to the Judge Dredd cinematic collection was released in 2012, this time starring Karl Urban and Olivia Thirlby. The continued popularity of this iconic character resulted in a partnership between 2000 AD and leading Sydney gaming developers NextGen (part of the incredible NYX Gaming Group) who created the first ever Judge Dredd online pokies game. And the result is magnificent. The Judge Dredd real money online pokies game is flawlessly presented, with five reels, 25 fixed paylines and no less than nine coin denominations. Utilising NextGen’s much loved SuperBet option, players can place an additional wager to activate more wild symbols. Playing for real money allows players the maximum bet of $50 per spin. 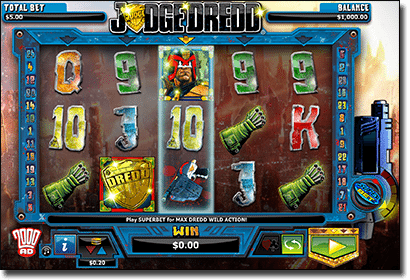 Game bonuses: Judge Dredd offers two main bonus features; I Am the Law and Free Spins. I Am the Law is a fairly simple bonus, where Judge Dredd will appear at random after a winning spin to present the player with a cash prize. The prize value will vary, but you can expect around 5-10 times the amount of your original bet. Free Spins is the bonus that you really want to get your hands onto. The awesome feature is only activated when you land three or more badge (scatter) symbols anywhere among the reels so although a rare sighting, it’s definitely worth the wait. Activating this bonus will result in 10 free spins with a 2 x multiplier that will double all of your winnings. When free spins are in play, wilds also appear more frequently, giving you the chance to re-enable the free spins bonus all over again. Wild Symbols : Judge Dredd offers the potential for a complete frenzy of wild symbols especially when the SuperBet feature is in play, making for greater winning potential and an exciting online pokies experience. Wild symbols will also appear more frequently during free spins. This highly anticipated game is fresh off the NextGen market and it certainly doesn’t disappoint. A prime example of the innovative and fun things that are happening over at the NextGen Sydney offices, there are so many things that make Judge Dredd awesome. The theme and visuals will have strong appeal to any fans of this iconic comic character, with animation that stays true to the original 2000 AD design. The graphics will be the high and the low point for players, depending on their personal taste and loyalty towards the Judge Dredd character. Whether the visuals are your cup of tea or not, there’s no arguing that NextGen did an impeccable job of maintaining the essence of the Judge Dredd empire. Judge Dredd would be considered a mid-variance game, but the free spin feature steps things up a notch and couldn’t be better, increasing your winning potential as well as leading to bigger wins. Taking advantage of the Superbet feature is highly recommended as wilds will increase your chances of winning and it also adds a fun element to the game. Overall Judge Dredd is an impressive pokies experience where big wins are possible, especially when unlocking those tasty free spins. Players benefit from NextGen’s finger-on-the-pulse technology, with crystal clear graphics, great audio and availability over a range of platforms that allow for desktop and mobile play. Head to G’Day Casino to try the game for free or sign up for real money play in Australian currency. G’Day Casino offer new users a special welcome bonus that will help increase your chances on your first visit, so if you’re not already a registered user then now is the time.